I call this cajun because of the spice, but I’ll be the first to admit I don’t have much actual on-site experience with real cajun cooking. I’ve been around Louisiana, but it was a long time ago. I was just a kid on family holiday. Guess you’d have to talk to my mom, who’s actually taken cooking courses in New Orleans. Because of my experience with Indian cooking, I often use Indian spices in my chili. There’s a similar, popular Indian vegetarian dish, Rajma Curry, but it focuses on the red kidney beans. This recipe is much more exciting. 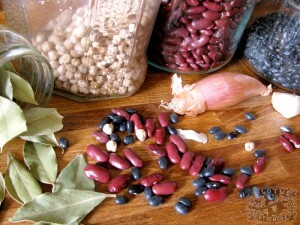 Big pots of dishes like this 3 Bean Cajun Chili are great for picnics, parties. Or just when you want to cook a lot of something and have it around for the next few days. You can always refrigerate or freeze the extra amount. If you don’t eat it all up because it’s so good, of course. Heat oil in a large pot or pressure cooker on medium. Add garlic, onion, cumin, pepper, paprika, chili. Fry 2-3 min stirring regularly. Add 1 cup / 240 ml water, tomatoes, carrot, corn, tomato paste, lemon juice (or vinegar). Stir well. Return to low simmer. Cook covered for 10 min. Add green pepper, mushrooms, thyme, sugar, nutritional yeast, and more water if needed. Continue to cook uncovered. Reduce, stirring occasionally, for 5-10 min. Stir in salt. If the consistency is about right, cover and simmer for 5-10 minutes. Garnish with vegan sour cream and/or vegan cheese if desired. Serve with rice, crackers, or bread. Other spices & ingredients: Experiment! Possible extras (add for last 20 min of cooking): 1/2 cup cashews or walnuts, 1/4 cup chopped dates, 1/2 to 1 cup of chopped celery, pear, red and yellow bell pepper, smoked tofu, broccoli or cauliflower florets. Adjust spice and salt as needed. 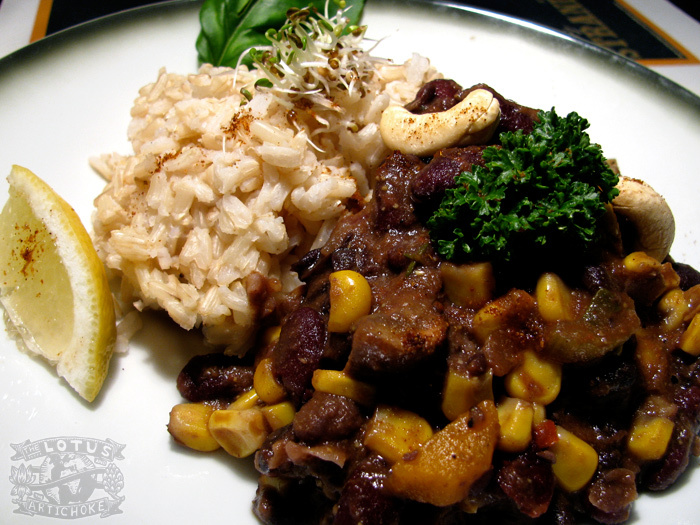 This entry was posted in American South and tagged black beans, cajun, chickpeas, chili, kidney beans, recipe, spicy, vegan. Bookmark the permalink. It’s quite a bit too hot to think about making a big bubbling vat of chili right now, but the spicing on this does sound fantastic. I’m gonna have to file it away for the fall- It will be the perfect thing to have on hand in a few months! Hannah, I totally believe you! I’ve been hearing from friends and family how intolerably hot it’s been on your side of the Atlantic. I just got another comment from a friend saying, “In this weather? !” (Well, over here in Germany the temperatures have been more moderate recently.) Maybe you’ll get a fall-like rainy day in the next few weeks. I made this tonight, first chilly rainy day of the fall/winter/spring in Seattle. I find the ingredient list a bit confusing. Ingredient lists are often easiest to follow in order of how it is added or alphabetical. I had to jump around to determine what I needed next. Also, in one place it calls to add the sugar and then later to add maple syrup, but those appear to be a single ingredient. Wasn’t sure what you intended there. Overall, it was a really good chili with lots of flavor. I plan to make more recipes from the blog, and have backed the book. I look forward to those recipes as well! Hi Adrienne, Thanks for your feedback. You’re absolutely right– I improved the listing, order, and directions for clarity. I’m glad to hear the chili turned out well for you, too! Thanks for the visit and thanks for the comment. Happy to be of inspiration and motivation. Let me know how your chili turns out!